Theresa May has vowed to see her Brexit deal through, but as this week's events have shown, a lot can change in politics - and fast. Here are the possible scenarios of her next move and what it could mean for the future of Brexit. The prime minister managed to get her draft withdrawal agreement through cabinet on Wednesday, only to see two members resign in protest at it the following day. Some had expected further walkouts but Michael Gove and Liam Fox, both prominent Brexiteers, have rallied behind her. The threat of a no-confidence vote from Tory MPs remains, but if she does stay on office - and her defiant performance at a Downing Street press conference and on an LBC radio phone-in suggests she is not going anywhere - can she stay on course with her deal? First up will be the emergency EU summit on 25 November where the UK and 27 EU member states will meet to sign off on the withdrawal agreement. The noises from the continent have been positive, with Germany's Angela Merkel saying she was pleased with the progress and France's Finance Minister saying the deal was "good news for the French economy". EU chief negotiator Michel Barnier paid tribute to Theresa May at a meeting of member states' ambassadors in Brussels this morning but said that the EU had to protect its principles even if there were political problems in the UK. The consensus, according to our man in Brussels, Adam Fleming, was that the EU should keep calm and not provoke the situation in the UK. But officials point out that European Council President Donald Tusk has left the door open to the 25 November summit being cancelled if something "extraordinary" happens. Diplomats' lives in Brussels are now a combination of missed meals, late nights, meetings and speculation about the state of the British government, says Adam Fleming, who is on a similar schedule. While the determination of Mrs May makes this scenario seem unlikely, it is possible that with continuing criticism from her own party, and perhaps more resignations in the offing, the PM could throw in the towel. If she leaves No 10 over the issue of her withdrawal agreement, the UK could then change direction entirely over its exit from the European Union. Brexiteers like David Davis and Jacob-Rees Mogg want to go back to Brussels and renegotiate - something EU leaders have made clear they are not open to. Others, like pro-Remain Tory Anna Soubry, have suggested a government of national unity, seeing a coalition of MPs from all sides come together to get us through - a concept normally associated with times of war. But again, Mrs May has made clear her intention is to stick it out. This scenario would make the PM's fighting spirit null and void. If the Conservative Party wants to oust her, MPs have to write letters to the chair of the 1922 Committee - made up of backbenchers - saying they have no confidence in her. If the chair, Sir Graham Brady, gets 48 letters - the equivalent of 15% of Tory MPs - a vote of confidence is triggered and a secret ballot takes place. If Mrs May wins, she becomes immune from another challenge for a year. But if she loses, there would be a leadership contest, and she would not be able to stand. It is a risk for Brexiteers, who would face the prospect of trying to persuade Mrs May to change course on Brexit for another 12 months. But if the party votes against her, it becomes a battle between its two opposing wings, and the direction of Brexit could be determined by which side comes out on top. What happens to Brexit if May is ousted? It is difficult to see how the 25 November EU summit to sign off on the deal could go ahead if Theresa May loses a confidence vote in the next few days. It is up to Sir Graham to decide when such a vote will be held, once he has received the required 48 letters from Tory MPs demanding one, but he has said the process will move quickly. The last time a Tory leader was ousted by their own MPs, in 2003, Iain Duncan Smith faced a confidence vote the next day. If Mrs May loses she will continue to be prime minister until the leadership contest is over but she won't be allowed to take part in it. She could opt to resign and hand over to a caretaker prime minister. In either circumstance, her version of Brexit, as set out in the withdrawal agreement and future relationship document, would be in doubt. European Council President Donald Tusk has said the summit will go ahead unless something "extraordinary" happens - he did not elaborate on what that might be. Sebastian Kurz, the Austrian chancellor who currently holds the revolving EU presidency, told Die Presse: "The next week will be intense, because of course it will be crucial if there is a majority for a vote of no confidence in Prime Minister May. In any case, as the EU Presidency, we have made all the preparations to move forward swiftly." So let's say she survives the attempts of her own colleagues to oust her and gets her deal signed off in Brussels - then there is the small matter of the "meaningful vote" promised to MPs. As things stand, with dissent from her own backbenchers, anger from her partners in the DUP, and Labour and the rest of the opposition lined up to vote against it, the numbers do not add up to getting her withdrawal agreement through. 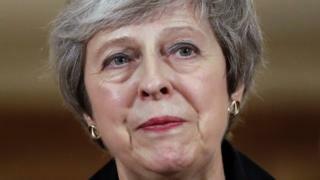 There is rumoured pressure for her to allow a free vote of all Conservative MPs - a highly unusual move which would involve suspending collective cabinet responsibility. Her predecessor David Cameron allowed his ministers to campaign for Leave or Remain as they saw fit during the referendum - but a vote in the Commons is a different matter. Downing Street has said there will be no free vote. And if the past three days are anything to go by, the PM will continue to hammer home her message that the public wants Parliament to "get on with it" and hope that is enough to win MPs over. She will try to present MPs with a take-it-or-leave-it choice between her deal or no deal in the hope enough waverers will be frightened into backing her. Labour will be using every weapon in their Parliamentary armoury to ensure other options are put to the vote. If MPs do reject the deal we are into full scale constitutional crisis territory. Britain would still be on course to leave the EU on 29 March - it's the law - but all sorts of possibilities come into play that could cause delays and renegotiations. It would be one way out of her bind if the deal is voted down, but the PM has repeatedly ruled out going back to the public to ask for their say on the deal, and her Leave-supporting critics feel the same way. Prominent pro-Remainers from both sides of the House - including Tory Dominic Grieve and Labour's Chuka Umunna - alongside the Lib Dems and Greens and a growing public campaign for a "people's vote" think differently. But unless Mrs May performs a shocking U-turn, or there is a new prime minister, it would be down to Parliamentary manouvering to get a vote on it, which might not pass, although Labour has not ruled out backing a referendum. Time is also running out to hold a campaign before Brexit day, so Article 50 might have to be extended, something Brussels might agree to, but a lot would depend on the proposed question on the ballot paper. Image caption Would Theresa May risk another general election? This is Labour's preferred outcome. It they win they would have to ask for an extension to Article 50 to give them a chance to go to Brussels and negotiate their version of Brexit. Mrs May is unlikely to be keen on trying to get backing for another election, given her experiences last year, but in the current climate it feels like almost anything is possible.